Although the name of one maker may grace a camera, it's companies overlapping each other in a highly competitive industry that spur creativity and innovation. Early in his career, Simon Wing exhibited a talent for innovation in a young photographic industry with the invention and refinement of multiplying cameras; apparatus capable of producing many images on a single plate. While conventional in appearance - looking like a traditional tailboard field camera - Wing's View Camera may have been an attempt (or experiment) to infuse elements of his early designs into a body pattern already moving past its first decade. As described and illustrated in Wing's 1887 patent (361,387) and catalogue, two key features stand out; panels to shift the lens board horizontally and vertically, and a ball and socket mount allowing a lens- tube to universally tilt in any direction. Yet a third, subtle but important feature discloses the camera's true intention. Wing had a specific use in mind for his first field camera as noted in the registered patent. The following entry in Wing's patent is a testament to his expertise in understanding the nuances of a successful multiplying camera design. 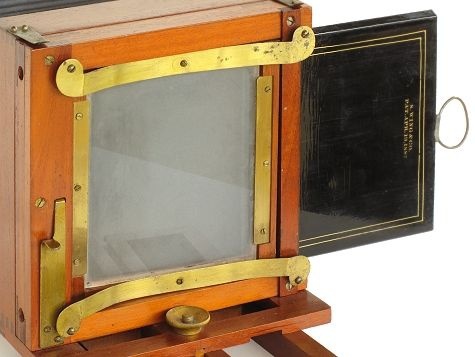 The camera had several other interesting features including a fixed ground glass frame held in place by a pair of brass strips, patent metallic platerholders (only 1/4" thick! - patent # 361,388), and a simple rail lock beneath the camera. Wing's View Camera was offered in three standard sizes: 4 x 5 ($12), 5 x 8 ($16), and 8 x 10 ($24). According to Mike Kessler (collector / historian and noted Wing expert), the horizontal shifting feature was a $2 option. Above: Rear view showing the reversible back and how the metallic plateholder slides under the ground glass. The plateholder is inserted and held in place by a brass stud. The light shield is then pulled out to expose the plate. Taken in whole, the camera is a remarkable instrument, but in reality few if any were sold. In the early 1970s, the collector community learned of Wing's great-grandson and an estate of photographica. The Wing / Nilsson estate included thirty cameras, of which six (6) were new condition examples of Wing's View Camera. One other 4 x 5 example was found in Japan and now resides in an American collection. 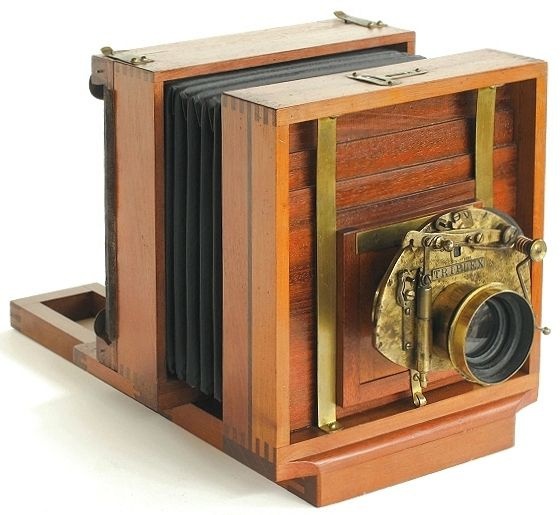 While Wing's View Camera might have been sold as late as 1910 according to Kessler, the sliding panel design eventually found its way onto Wing's rare Special Button Camera No.1 and the popular New Gem and Ajax penny picture cameras of 1899. For those interested in learning more about the lore and legacy of Simon Wing, I highly recommend finding a copy of Mike Kessler's excellent monograph entitled After Simon Wing Photography Was Never Quite The Same originally published in the Photographist, Number 102/103, Summer/Fall 1994. Wing's View Camera. Reversible 4 x 5 inch format. This invention is most useful at photographing objects not on a level with the camera and high buildings at short distances. In using clusters of lenses for making several pictures on a plate at once, it is necessary to have all parts of the plate equidistant from the lenses, or the pictures will not come in focus together. A camera with a rigid upright back is best adapted for this purpose, and by attaching the lens-holder to the front of the camera it renders it equally for viewing and other work. 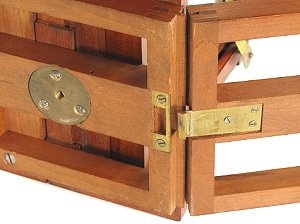 Detail of the unique brass rail lock. It is simple, easy to use and surprisingly secure. And unlike apparatus by competitors, Wing's View Camera was purposely designed with a rigid back - the third feature. While this might appear as a drawback, it permits the camera to be used as a multiplying apparatus.